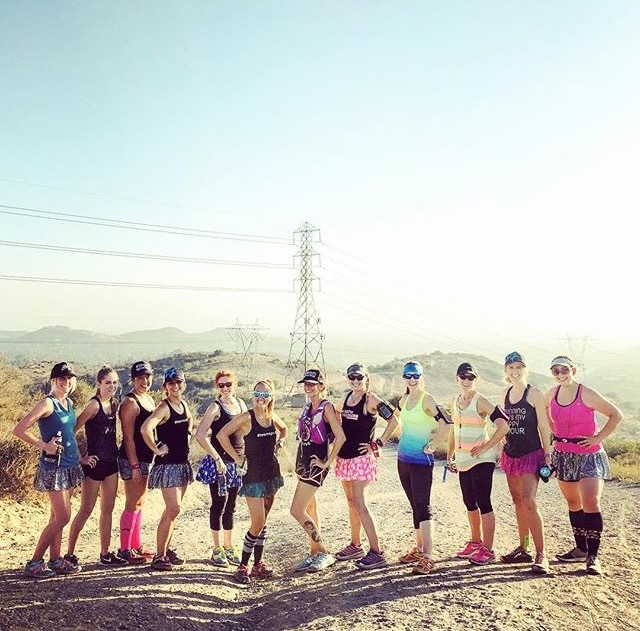 Did you know that the ladies of Sparkle Athletic are putting together #TeamSparkle Trail Thursday runs throughout the summer?! Well, if you didn't know, let this serve as your warning. You may have missed out on the first one (since it was yesterday), but make sure to check out their Facebook page to see the upcoming events (one on July 21st and one on August 11th). The runs are open to everyone - no matter your pace or experience on trails - so if you can make it work, I'd highly recommend it. I made my way to Orange County yesterday afternoon. I am never fully sure about SoCal traffic, so I tried to leave with plenty of time to get me there (leaving at 4:15pm got me there around 5:40... but thankfully we weren't meeting until 5:45 so I had a couple minutes to spare). I may look calm as a cucumber, but trails tend to freak me out a bit! We met up at a nearby Albertson's parking lot (since you have to pay to park at the trails, why not car pool and save some money?!) at 5:45pm to be to Santiago Oaks Regional Park by 6pm. There were 13 of us in all! We decided we'd all stay together and knock out 4 miles on the trails. We'd stop every half mile or so (depending on the terrain) to catch our breath and regroup. There were some decent hills to climb (thankfully I was a little prepared since Carrie took me to run this park a few months back), but we conquered them like the strong women we are! Even though we didn't start running till after 6pm, it was still rather warm (I think the car said 82* when we started). Thankfully once the sun started to set the hills offered some decent shade and we would get a lovely breeze every once in a while. best Bigfoot impression... How do you think I did?! The views were pretty AMAZING (although, I've gotta #KeepItReal... I wasn't taking them in as much as I could, seeing as I was trying not to twist an ankle or step in horse poo, but whenever I was brave enough to lift my head for a second or two what I saw was stunning). There was even a waterfall along our route! SHOOT DOGGY! A waterfall... We aren't in a drought... Apparently all of the water is hiding in the Santiago Oaks Regional Park! TOAD STOOLS! Although I don't remember seeming any frogs around. All-in-all we ended up with 4.44 miles (just about perfect, right EMZ?!) and were back where we left our cars by 8pm. Word to the wise... NEVER look at your pace when trail running! It was a great way to spend my Thursday (even if the 5 hour trip 'only' led to a 4 mile run, the drive is ALWAYS worth it)! 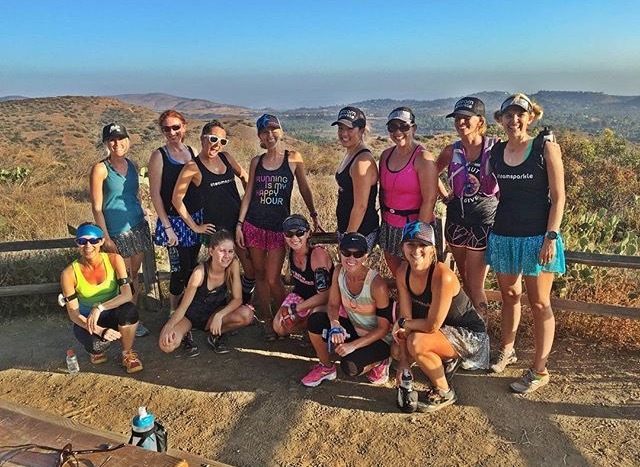 I won't be able to make it to the next two trail runs, but if you're in the OC area you should totally back it happen! They will be meeting at different trails around the area so check the event pages and put them on your calendars! What are your thoughts on trails? Love 'em? Hate 'em? Think every stick is a potential snake? Here my trails are for every kind of level. You can have easy ones or very hard and long ones. When I've done my first trail run race, it was 11km with 800m D+. The long course was 21km with 1300m D+!